This volume brings together 11 essays by the distinguished philosopher of science, Peter Achinstein. The unifying theme is the nature of the philosophical problems surrounding the postulation of unobservable entities such as light waves, molecules, and electrons. How, if at all, is it possible to confirm scientific hypotheses about “unobservables”? 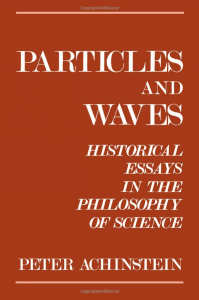 Achinstein examines this question as it arose in actual scientific practice in three nineteenth-century episodes: the debate between particle and wave theorists of light, Maxwell’s kinetic theory of gases, and J.J. Thomson’s discovery of the electron. The book contains three parts, each devoted to one of these topics, beginning with an essay presenting the historical background of the episode and an introduction to the philosophical issues. There is an illuminating evaluation of various scientific methodologies, including hypothetico-deductivism, inductivism, and the method of independent warrant which combines features of the first two. Achinstein assesses the philosophical validity of both nineteenth-century and modern answers to questions about unobservables, and presents and defends his own solutions.